We’ve had a bit of a snafu. 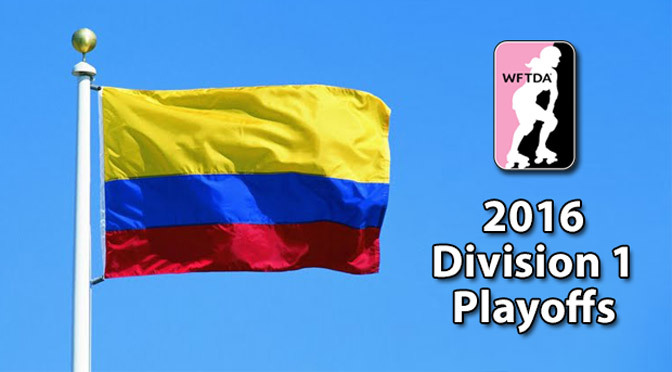 When the WFTDA announced the locations for the 2016 WFTDA international playoffs, we got all excited that one of the international playoff sites would be Colombia. Friendly locals! Damn good coffee! Ecologic diversity! Equatorial paradise! The guerrilla war! … Damn good coffee! We spent weeks preparing a preview that would incorporate wonderful facts about the South American country with all the roller derby stuff that normally goes into our WFTDA tournament coverage, like capsule summaries for each individual team and a stats review of the past weekend’s action. Just as we were ready to hit the button and post the article to the internet, a funny thought crossed our mind. We decided to double-check the WFTDA tournament page for Colombia one last time, just to make sure things were okay. That’s when we realized, things were not okay. Yeeeeeeeeeeah. It turns out the second international WFTDA playoff Division 1 tournament isn’t in Colombia, South America. It’s in Columbia, South Carolina. An honest mistake! Anyone that has moderately poor penmanship could have made it. Lucky for us, the preview was easy enough to fix. All we had to do was replace the lovingly crafted ode to Colombia with some token facts about Columbia, and you schmucks would be none the wiser. But we really really didn’t want to throw out these lovely facts about Colombia. We’re still figuring out what to do with them. While we think about it (and hastily pull up Columbia’s Wikipedia page) let us distract you with a statistical perspective of the roller derby that happened in Quebec last weekend. The preview for the Columbian Division 1 playoffs will follow. D1 Quebec Stats Review: OMG!!! First, let’s congratulate London, Texas, and Montreal for taking the top three places last weekend in French-Canada and advancing to the WFTDA Championships in Portland this November. For winning in Montreal, London gets a bye at Champs. Last week, we mentioned that the Division 2 tournament weekend in Lansing set a record for the most heavily-penalized playoff weekend in WFTDA history. Remember that? Well, something rather unexpected happened in Montreal for the first Division 1 tournament. Unexpected in a good way, mind you. At only 60 penalties per game, it’s the cleanest tournament roller derby seen in the WFTDA since…well, since we started keeping track of playoff penalties in 2011. That’s a whole 20% fewer penalties committed compared to the average rate of 74.3 penalties seen during the four Division 1 playoff tourneys. Hell, it’s even cleaner than the 69.0 penalties that happened in the average game at WFTDA Championships in 2015. In a certain light, this should have been expected, not unexpected. With the whole extra year to study and understand the 2015 WFTDA rulebook, then practice and apply the lessons learned from the previous season to this one, one would have thought that penalties would have stabilized, if not gone down. They went down, alright. Way down. The drop in penalties came with a rather remarkable statistic, courtesy of all the crazy-close games that happened on Sunday. Here at Roller Derby Notes, we have a special designation for games that are very close from start to finish. Those that not only come down to the final jams, but where it’s clear throughout the 60 minutes that neither team will be able to avoid it coming down to the last jam. We call these OMG!!! games. There’s a technical statistical threshold that needs to be met for us to give a game this label—read about what that is in our 2015 Playoffs Exstataganza—but to make it easy for you, just know that four of those five Sunday games in Montreal were all OMG!!! games in our book. You read that correctly. There were just about as many OMG!!! games in one tournament weekend as there was in the entire 80-game Division 1 playoff season last year. Super-close, super-tight games were few and far between last year, and now they’re all over the place all of a sudden. Our first thought about this turn of events is to wonder how direct of an influence fewer penalties has on level of competitive parity. There’s evidence of a relationship in the Division 2 data from this year: Wichita averaged 20 fewer penalties per game and had an average margin of victory 21 points closer than in the games at Lansing. This weekend, and the following playoff tourneys, will go a long way in determining if low(er) penalty counts are here to stay, or this was just a low outlier. There some other interesting things happening in the bigger-picture world of WFTDA-wide scoring and penalty data. We’ll save those for next week’s stats review to see if those trends stay trendy, or they’re lost to good the void that is WFTDA inconsistency. 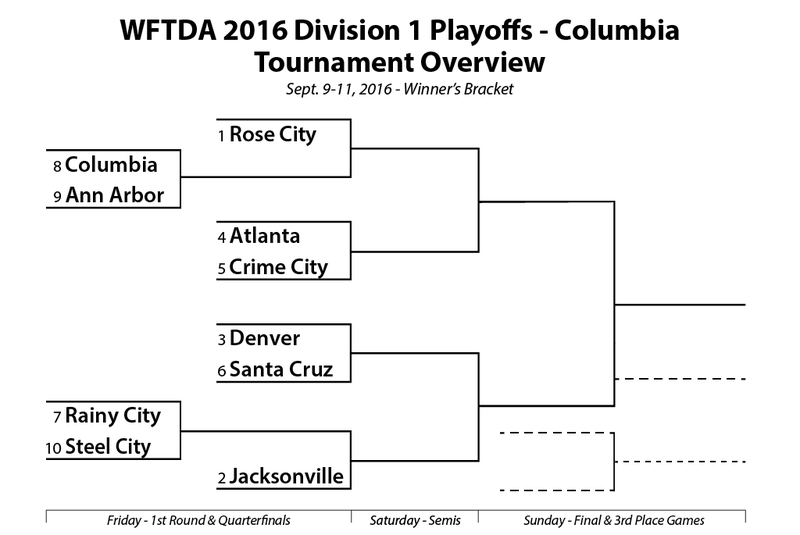 2016 Division 1 Playoffs – Columbia, S.C. Okay! We’ve found some interesting stuff out about Columbia, S.C. (For instance, did you know that the city was almost named Washington, after our first president?) We still have some neat nuggets of truth about Colombia, too. What to do with all of this trivia? What else, but have a quiz! It’s time to play…Colombia or Columbia? There are ten teams participating in the D1 Columbia tournament. Each team preview will be followed by a random fact. You, the reader/contestant, will need to ascertain if it is a fact about Colombia, South America, or Columbia, South Carolina. Write down your answer—no cheating!—then click on the popup footnote (this thing —>1We also have these around the site in our other articles. Gotta catch ’em all!) to see if you guessed correctly. Right or wrong, you’ll get some more factually fascinating information about Colombia/Columbia. It’s fun, and it’s educational. Just like roller derby! WFTDA Champions Rose City Rollers—that sounds pretty nice, doesn’t it? Let’s say that again—the WFTDA Champion Rose City Rollers are heading into the playoffs with something to prove. Not that they didn’t prove it last year, toppling Gotham’s five-year winning streak en route to capturing the Hydra. Now that they’re the champs, the target is on their backs. With home field advantage at Championships this year, they don’t have many excuses if they can’t get back into a position to defend their title. You could make some excuses for Rose’s 150-138 loss against Victoria at The Big O, however: Rusty for the first event of the season, an extremely penalty-heavy game (31 jammer penalties out of 82 total) that led to keys foul-out on both sides (Scald Eagle only jammed twice in the second period before exiting), resulting in a sloppy game not worthy of the skill level of either team. VRDL isn’t in Columbia, but the two most threatening opponents RCR will may face this weekend are. Atlanta and Denver are potential opponents for Rose City in the divisional semis and finals. Atlanta is no threat, and Denver has lost to Rose City twice by a comfortable margin. Colombia or Columbia? – Known for its drug trade and high rate of violent crime.2Colombia, South America. Infamous drug lord Pablo Escobar reportedly once offered to bribe his way out of facing justice by paying off the country’s $10 billion national debt. Jax is looking to get another berth into the finals. To help with that, they have enlisted the help of USA Roller Derby and Steel City veteran Snot Rocket Science, who transferred down to Florida this season. That’s a big add to a roster already loaded with capable jammers like Krispy Kreme-Her, Jamsterella, and of course the one and only Erin Jackson. Colombia or Columbia? – Has the largest network of bicycle lanes and paths in the region.3Colombia, South America. Bogota, the capital city of Colombia, has over 180 miles of dedicated and shared bicycle routes, linking poor and affluent communities together. It is estimated that between 300,000 and 400,000 trips are made by bicycle daily. They may be seeded below Jacksonville, but Denver is coming into Columbia with the advantage over their probable semifinal opponent. The two also played at Sibling Rivalry, and Denver beat them there 181-167. That’s a close enough game to put any potential rematch into toss-up territory, especially one that would punch a ticket to champs. However, Denver has had a lot of turnover in their jammer rotation, picking up some players from Rocky Mountain after their roster shakeup as well as other transfers from other leagues to the easy. In fact, the reshuffling was so significant, the only workhorse jammer left from the previous season was Stacey Wilhelm. The Mile Highers should be okay for the playoffs despite that. The team has played in 4 very close games this season, the most of any playing in Columbia. There’s nothing like putting your jammer corps through a lot of high-pressure jams to quickly galvanize the team . Colombia or Columbia? – Through the early 1800s, homes were required to have one bucket of water for every chimney in the structure, in case of fire.4Columbia, South Carolina. Fire brigades were formed in 1816 and all male citizens were expected to serve. These brigades were later replaced by volunteer fire departments. Since they made it to Champs in 2013 after starting as a 2-seed, Atlanta has been stuck in the middle of the bracket. The pattern for them has been win the 4/5 game, lose against the #1 seed, and hope things work out in the 3rd place game to get back to Champs. Should they beat Crime City, their first round opponent in said 4/5 game, they’ll certainly go down to Rose City. The Wheels of Justice soundly defeated Atlanta 291-113 in New Orleans in late July. They could face Jacksonville in the final round, who also won by a similar margin back at the start of the season, 231-91. Yet another win-lose-lose playoff season may be in the cards for Atlanta. Of course, they would need to win their first game for that to work out, one that may not be so easily predictable. Colombia or Columbia? – A zoo in the region houses over 2,000 animals on a cage-free, open-roaming reserve with 170 acres of recreated natural habitats.5Columbia, South Carolina. The Riverbanks Zoo & Garden serves to protect rare and endangered wildlife. It also safeguards a number of significant state historical landmarks, including remnants of the Civil War. The Swedes return to the playoffs after a strong debut in 2015. Last year they were seeded 8th after a light schedule made it tricky to gauge their progress. This year Crime City is leaving no doubt about their spot in the 2016 bracket, having won eight out of the nine sanctioned games played this season. Their only loss was a 72-pointer against Champs-bound Montreal when they played in Finland this past May. Three wins of significance were against #24 Helsinki, 156-91; #25 Stockholm, 158-68; and #35 Detroit 233-75. These results all match up neatly when Crime City’s rank, a top-half D1 playoff team. Though we have many more games with which to judge Crime City this year, European teams are still unpredictable when they come to the States for the playoffs. Add to that the built-in unpredictability of the Friday 4/5 matchup, and it’s anyone’s guess how things will go down. Just remember: If Crime City wins their first game, they’ll have a chance to go to Champs with one more win on the weekend. The Boardwalk Bombshells have been back and forth between D1 and D2, alternating each year. This year they’re in Division 1, matching their seed from the last time they were here in 2014. They finished that weekend in 7th place. Santa Cruz traditionally has a heavy schedule, and this year is no exception. On top of their ten sanctioned games, they played in an addition seven off the record. Their 210-151 loss to Helsinki at The Big O is one on the record that’s good for measuring where they stand in comparison to others in this tournament. Colombia or Columbia? – Home to the world’s largest fire hydrant, standing 40 feet high and weighing in at over 33 tons.7Columbia, South Carolina. The hydrant resembles the Leaning Tower of Pisa, tilted to one side “as if it had been knocked cockeyed by a giant truck.” No water is delivered to the hydrant, unless you count that one time Clifford the Big Red Dog came into town. It’s that team from the UK that isn’t London! They’re not everyone’s first thought when it comes to British WFTDA roller derby squads, but Rainy City is looking to change that by leaping directly up into the Division 1 playoffs. It was quite a large leap, too. After three blowout wins at Beach Brawl in May, Rainy shot up 87 ranking spots from #116 to the top 30 in a matter of days. A 42-point victory over #27 Kallio a few weeks later locked them into the #26 spot, good for a 7-seed this weekend. Just beware, bracket watchers: Rainy City is by far the lowest-ranked team playing in Columbia according to Flat Track stats. That #48 FTS ranking actually makes them an underdog against Steel City, their opening opponent (and against anyone they may face for that matter), so don’t be surprised if there’s a not-an-upset upset first thing Friday morning. Colombia or Columbia? – Local government imposes bans alcohol sales and consumption during major sporting events or elections to help prevent violence.8Colombia, South America. Article 15 of the official decree regarding prohibitions and rules in the presidential election states that Colombia’s “Dry Law” prohibits consuming and selling alcohol over a set amount of time, usually 36 hours. It was extended to 48 hours when Colombia was playing its first World Cup soccer game in 2014. Colombia or Columbia? Columbia! The hosts have always found themselves straddling the Division 1/Division 2 when the final playoff rankings were set, including one year when they only made it into the D1 tournaments after a team above them in the rankings declined their invite. After a great 2016 season, CQS is solidly in the top 40, giving them the opportunity to play in their own tournament. Having home field advantage in the playoffs is a pretty nice thing to have—how’d that work out for Montreal last weekend?—and Columbia has a good chance to improve from their starting position because of it. Notable games for the QuadSquad include a 135-point loss to #15 Tampa, a 27-point loss to #41 Charm City, a 1-point win over D2 finalists Charlottesville, and a 158-95 win over this weekend’s 10-seed Steel City. Here’s another team new to the playoffs this year. Like Rainy City, Ann Arbor is plunging directly into Division 1 tournament play. (Heck, the newbies could play each other later in the week if things work out.) Last year they were one spot away from making it into the Division 2 playoffs. This year’s boost up to the WFTDA top 40 should make up for that quite well. Many Ann Arbor wins were of the triple-digit variety versus teams in the Division 2 range they left behind in April and May. Their one loss on the year was against #33 Ohio, and though it was a big one on the scoreboard (244-139) it did help the team start their way up the rankings. The most interesting thing about AA’s schedule is a common opponent they have another team. Columbia beat Charlottesville by a single point in April. The next month, Ann Arbor also beat Charlottesville…by a single point. Columbia and Ann Arbor will play each other in their playoff opener. Do the math. Colombia or Columbia? – This country’s capital. 10Washington, District of Columbia. Trick question! (It’s the capital of this country.) FYI, Columbia is the capital of South Carolina. Bogota is the capital of Colombia, South America. Washington, District of Columbia is the Capital of America. Got that? Remember how we said early that Snot Rocket Science left Steel City for Jacksonville earlier? There’s always the other side to transfers like that, and this is it. The #10 seed is as low as Steel City has ever been in any playoff tournament, regional or divisional, since they first became a consistent postseason team in 2009. Steel had to not only replace their team’s go-to jammer, but all the points she scored. They’ve done it, but not to the level to which we all may be used to seeing from yinz. Their biggest wins this season have all come against the top teams in Division 2, including a 4-pointer over Charlottesville. Save for a 186-141 win over Naptown way back in February, Steel City has not beaten a team ranked higher than them. That’s not a promising sign for the 10th seed in a 10-team bracket. Steel City has a lot of experience on the bench, and it’ll need it to fill in the experience gaps on the jammer line if it wants to come away from Columbia in a better place than it started. Colombia or Columbia? – They play roller derby there.11Both! Columbia has three derby leagues, including a men’s team. Colombia has 29 known leagues, one of which is full WFTDA and another in apprenticeship. Derby everywhere, no matter how you spell it.